On November 15th, a group of gym associates from East Sussex made two Guinness World Records™ for the amount of individuals within both a 2012 MINI and a classic Mini. November 15 was observed as the eighth yearly Guinness World Records Day. The fun filled day witnessed more than 420,000 individuals gathered with the aim to hit records. 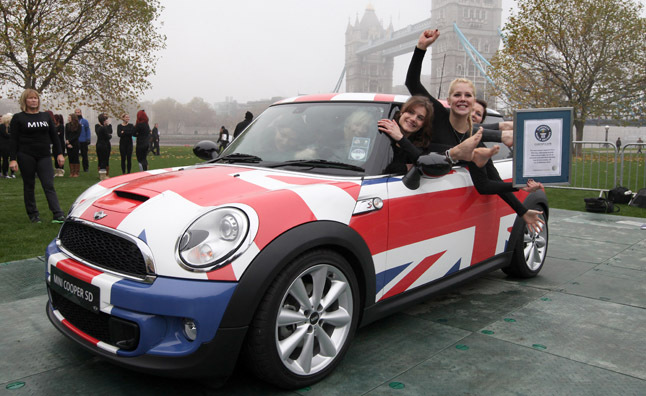 As per reports, twenty eight flexible females jam-packed their way in the MINI Hatch at Potters Fields Park, London. The said group shattered their personal preceding record of 27 individuals that they hit in Eastbourne during 2011. The female made complete utilization of each and every inch of space obtainable in the vehicles, comprising the footwells, the dashboard and they also attempted to push four individuals in the boot. As soon as they made their initial record the females dashed off to the ITV studios to try the second record live on This Morning, where by forcing an amazing 23 females into a classic Mini Cooper World Record, 28 people and a new Guiness World Record, they managed to hit the earlier record by two individuals.